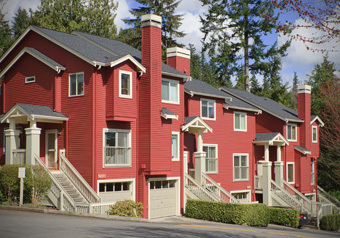 These 59 townhouse-style condominiums in Redmond are housed within 19 wood-framed buildings. Due to water intrusion issues, all of the building enclosure components required replacement, presenting the Board with a silver-lining opportunity to modernize the complex’s appearance. Amento Group conducted an investigation of multiple structural issues, resulting in legal action between the condo association and the developer. Our team assisted the association by prioritizing repair recommendations, developing plans for improvement of the waterproofing details, modernizing the complex with a new exterior scheme (which also saved on construction costs), and providing inspection services for the remediation construction.